Organizations are shared accounts, allowing groups of people to collaborate on several bots at the same time. Your user account (which is your identity on SAP Conversational AI) can be a member of any number of organizations. From your profile, you can create private and public organizations. Public organizations, their public bots, and members are visible to all. Private organizations, their bots, and members are visible only to the members of the organization. An organization must always have at least one administrator. If an organization has only one administrator, the administrator will be unable to update their own role, remove themselves from the organization, or delete their account until they make another member an administrator. If you are the administrator of an organization, you can add and remove members from the organization. To add members, go to the Members tab and click + NEW MEMBER. To remove a member, go to the Members tab, click the dropdown to the right of the user’s name, and choose REMOVE FROM ORGANIZATION. If you are the administrator of an organization, you can change the organization’s settings, such as change the organization’s name, assign permissions, make the organization private or public, and delete the organization. You do this on the Settings and Permissions tab. If you change an organization from public to private, the existing public bots of the organization are also made private. 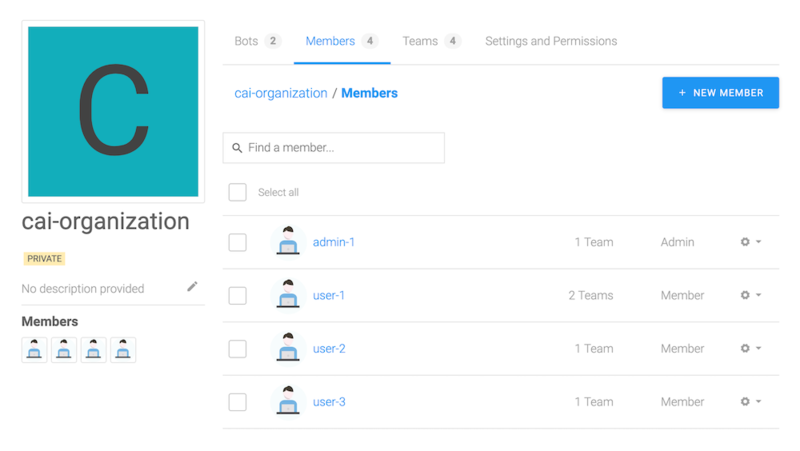 If you are the administrator of an organization, you can create and manage teams within the organization and assign additional permissions to them. See also Permissions. 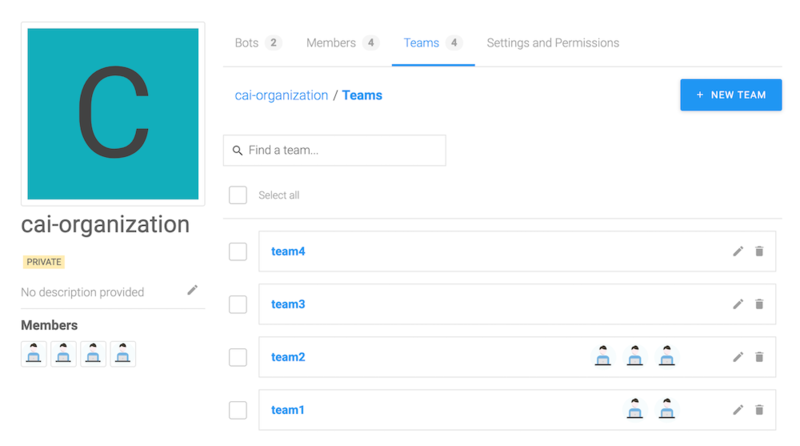 You can create teams and add members on the Teams tab. Tip: You can also add members to teams on the Members tab. You can change the name of an existing team and delete teams on the Teams tab. Go to the Settings page for the bot. Under Danger Zone, click TRANSFER OWNERSHIP.